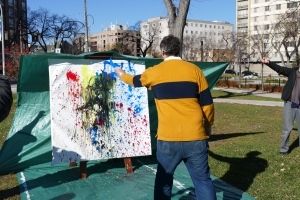 People in Winnipeg’s Central Park neighbourhood hurled paint onto canvases as part of a big community art project. Community members of all ages, including newcomers to Canada, threw cupfuls of paint onto a large canvas at the park on Thursday afternoon. The paint-flinging endeavour, called The Distance from A to B, was hosted by Studio Central, an urban arts centre in Central Park that is part of Winnipeg-based Artbeat Studio. “We are here to promote understanding and co-operation, and we think that the arts is one great medium to do that,” said Jan Nato of Studio Central. Tibebe Terffa, an artist from Ethiopia, led participants in splashing paint onto the canvas, which will be cut up and reassembled into a new work of art. The families that took part in the art project attend classes at the Mosaic Newcomer Family Resource Network, which provides English-language classes and child care for families that are new to Canada. “I hope they come away with an appreciation for art and its role in everyone’s lives,” Nato said. For more info on our Community Art Projects, contact us at studiocentral@artbeatstudio.ca.